You can’t see it too well, but Floyd is nudging Davis knowingly. And Ecta is poking Davis’s face with her tail. 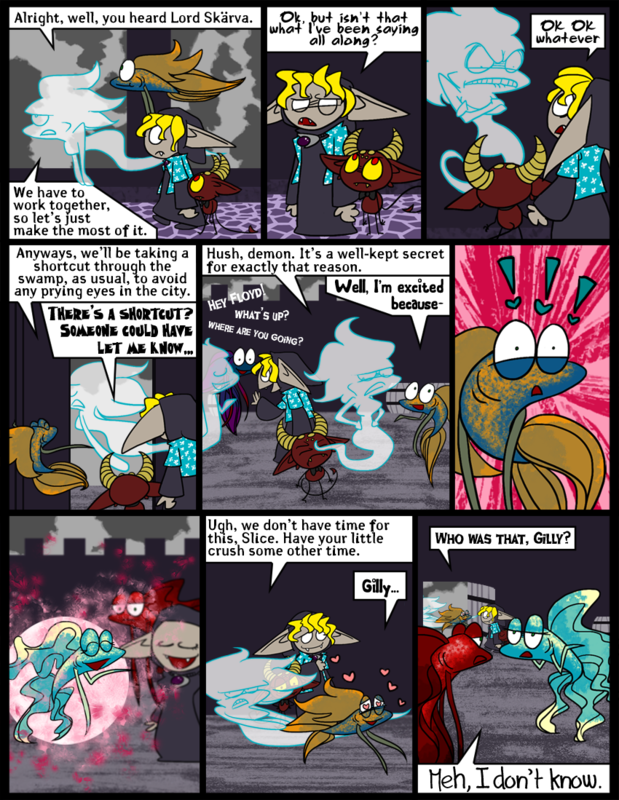 In this comic: [flish that resemble] my betta fish Sweeney and my old betta fish Magus Zheng-he Enguarde, the fish with three names. Rest in peace. Also both groups we’ll be following are now out of Castle Skärva THANK THE GODS I am so sick of awful dark purple backgrounds and having to throw in random tapestries and stuff to relieve that awful, awful purple-grey mess. PMS Ecta in Panel 3. Anyways, I’ve had three Bettas in my time. My first one died last summer, and I ended up getting two more. One is a sort of off white with red fins named Archimedes, and the other is mostly blue with purple fins called Wheatley. You mean normal Ecta? Maybe she died when she was PMSing, that would explain a lot. Does Wheatley look like this? Because that looks exactly like Magus did. I buried him in my yard and made a little circle of the stones that were in his bowl over the spot. I am very sentimental, and I just couldn’t stand to flush such a beautiful thing down the toilet. Looks exactly like him, but he has a slightly darker head. ….hmm? What do you mean? panel 5 who is Floyd talking to? Some friends. He’s a popular guy. Look at the Wikipedia entry for courtyard. The one in the picture has a fountain in the center and that’s it. It really is just a huge space with some stuff that’s there to look pretty. Yeah, they’re leaving through some kind of back/side courtyard anyway. The “main courtyard” is sometimes full of mazes and traps in preparation for the Hero, but they’re not set up quite yet. They should really get rid of the barrels, Blank keeps putting them over his head and sneaking around. Slice is the sweetest thing in Idenau and if she wants to miss out on that, it’s her problem.